A mile up a steep hill? The last mile of a marathon? A one mile track race? No, the hardest mile is the first mile you ever run. Sometimes we seasoned runners forget how difficult running a mile is for somebody who is not fit, not trained and not used to physical exertion. I’ve been told by a very reliable source that only 4% of the UK adult population are even able to run a mile without stopping, be it in 6 minutes or 12 minutes. So runners are rare. My highlight of the week was seeing my sister finish Woodhouse Moor parkrun, sprinting strongly to the finish, having run every metre of the 5 kilometre course without stopping. She started running only in January and after 10 weeks of training, guided and encouraged by the best mentor and coach that anyone could wish for, Hannah Corne, she crossed the line beaming. Way to go Sis! I had a cold mid-week. It was nothing serious – mainly just a runny nose, so my mileage was down. It probably helped me in that it acted as a bit of a taper for the Locke Park 20 mile race today in Redcar. This was a super event, really well staged by New Marske Harriers. The Garmin couldn’t cope too well with the lapped course, and my overall average pace was actually around 6:38 per mile. The flat nature of the course (total elevation 21 feet!) 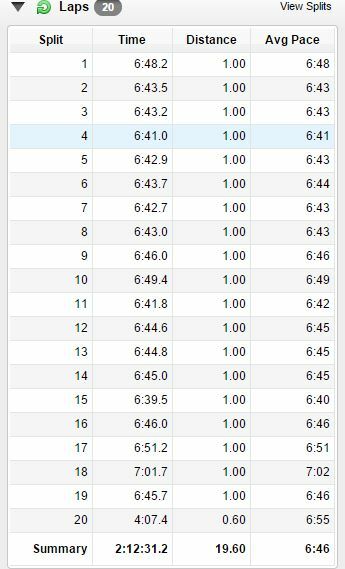 made consistent pacing much easier. I ran a little harder than I originally intended, but it was only in the last 4 or so laps that I felt I was having to dig in.